Rare US Nickels with Bullish Futures. Certain US nickels have shown solid price trend appreciation over long periods of time. These are generally considered rare nickels and have always been popular with collectors, providing the impetus for sustained value growth as far into the future as we can see. Obviously, there are more than just a couple of Buffalo Nickels that should be considered as bullish five cent coins. Eventually, a few half dimes will be listed, as well as Shield Nickels and Liberty Nickels. There are significant rarities in all these groups, worthy of the "bullish" label. There probably won't ever be any Jefferson Nickels to grace this page, simply because there are no truly rare dates in the series, even though this workhorse has been around since 1938. The Jefferson Nickel is the only nickel most of us living today have ever known. The early issues are relatively scarce when compared to rest of the group, yet remain in abundant supply. Believe it or not, dates from the 1930's and 1940's can still be plucked out of circulation. Young collectors (or anyone for that matter!) can have loads of fun searching nickel rolls for the older stuff. After you're finished with this page, there are a couple of sections we recommend you visit. There are some five cent coins tracked in the Rare Coin Values Index with blue ribbon track records, holding solid promise for sustained growth in value (some will rightfully end up on this page, complete with "The Year This Coin Was Minted..." treatment). Also, check out the Jefferson Nickel page, where this icon of American life is shown some well deserved respect. A few months after the release of the Buffalo Nickel in early 1913, it was evident the date and denomination “FIVE CENTS” were wearing down too quickly. Engraver Charles Barber eliminated the mound and stood the buffalo on a straight line, creating a recessed area below the line where the “FIVE CENTS” was protected. Numismatists differentiate between the mound and straight line issues, calling them Type 1 and Type 2, respectively. The problem with the date wear was never resolved, resulting in a significant percentage of the 1.2 billion Buffalo Nickels not having readable dates. The 1913-S Type 2 Buffalo Nickel is a glittering jewel in the eyes of collectors, as proven by the relentless price hikes with the march of time. As long as Buffalo Nickels are popular with the collector base, which is akin to saying forever, the 1913-S Type 2 will be in strong demand. All grades are attractive, but as with any valuable US coin, be sure to deal with a reputable seller. If the coin is encapsulated by any of the most highly regarded grading services (PCGS, NGC, ICG, or ANACS), a slew of buyers will aggressively jockey for the inside lane if you decide to sell. The 16th Amendment to the U.S. Constitution took effect on February 25, 1913. The amendment, which allowed Congress "to lay and collect taxes on income from whatever source derived", was brought about due to the 1895 Supreme Court ruling forbidding a tax on income. Anxious to leave Washington for the Christmas holiday, Congress voted to pass the Federal Reserve Bank Act on December 23. At the heart of the new system was the power of the Federal Reserve Board to control the supply of money by influencing the interest rates large banks charge one another for federal funds. Objectives of the Federal Reserve included maintaining stability of the nation's financial markets, avoid banking panics, and to strike a balance between private interests of banks and the centralized responsibility of government. The 17th Amendment was also was enacted in 1913. Since the inception of U.S. Constitution in 1789, state legislatures selected two persons to represent state interests in the U.S. Senate. This amendment mandated election of Senators by the direct vote of state citizens. The leader of the Indian Passive Resistance Movement, Mahatma Gandhi, was arrested in South Africa after marching with 2000 Indian miners demanding civil justice. Henry Ford pioneered the moving assembly line concept, reducing car assembly time from 13 hours to six. Ford dropped the price of the Model T to $440, explaining "every time I reduce the charge for our car by one dollar, I get a thousand new buyers." 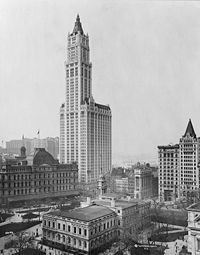 The Woolworth Building of New York City was completed in 1913. Rising to 57 stories, it was the tallest building in the world, holding this distinction until 1930. The construction cost of $13.5 million was paid for in cash by the company's founder, Frank Woolworth. The official opening occurred on April 24, with President Woodrow Wilson in attendance. In 1937, an inexperienced Denver Mint employee improperly used an abrasive stick in an attempt to remove clash marks from a Buffalo nickel reverse die. In the grinding process, the bison's foreleg was removed, and coining was then resumed with the "repaired" die. Before inspectors realized the goof, a small quantity of "3-legged" nickels escaped into circulation. From that moment to this very day, the 1937-D 3-legged variety has been one of the most desired Buffalo nickels, with a legacy of solid price advancements to prove it. Buff collectors needn't fear overpricing, though, because if held long term, the 1937-D 3-legged variety has always moved higher and higher. Purchase only from a reputable source... many fakes exist. By 1937, the threat of global war was becaming increasingly ominous. Adolf Hitler, the ruthless dictator of Nazi Germany, was becoming evermore aggressive, as was Italy's Benito Mussolini. In July, the warlords of Japan invaded and occupied large portions of China. Meanwhile, the bloody Spanish civil war entered its second year. On the American home front, disillusionment, pacifism and isolationism, compounded by persistent economic woes, carried the day, despite President Franklin Roosevelt's best efforts to rally the public. In December, Japanese planes bombed the US gunboat Panay while it patrolled China's Yangtze River. Fearing a confrontation with Japan, a solid majority of Americans favored total US withdrawal from the Far East. Other headlines from 1937 include the mysterious disappearance of aviatrix Amelia Earhart on a Pacific flight. Elsewhere, Margaret Mitchell won a Pulitzer Prize for her novel, Gone With the Wind. 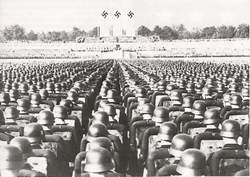 Nazi rally in Nuremberg, Germany. Throughout much of the 1930s, while the US was mired in the Great Depression, military dictatorships in Germany, Italy, and Japan were busy preparing for war. Pacifism in the US and Great Britain helped enable the rise of the Axis powers, sowing the seeds for the most catastrophic conflict in human history.